In this webinar, Alexandra Garatzogianni, Senior Research and Innovation Project Manager at the Leibniz Information Center for Science and Technology, University Library (TIB) and at the Leibniz University of Hannover, will moderate a discussion between Edna Ruckhaus, Senior Researcher at the Ontology Engineering Group (OEG) and Mari Carmen Suárez-Figueroa, Lecturer at the Artificial Intelligence Department (Universidad Politécnica de Madrid) and Senior Researcher at the Ontology Engineering Group (OEG). The main focus of the webinar will be the SlideWiki trials “experience”, as well as the lessons learned on OCW authoring and training during the three years of the project. More specifically Edna will present the SlideWiki project and elaborate on the conducted trials and the input received for the platform’s evaluation and sustainability management. Moreover Edna will showcase the processes of importing, creating, and reusing presentations at the SlideWiki platform, as well as the lessons learned. Mari Carmen will present the process implemented for designing the setup for training, with emphasis on activities that can be undertaken and completed by trainees in SlideWiki. Furthermore Mari Carmen will present and elaborate on the lessons learned during SlideWiki’s training activities. Please register now in order to reserve your slot and receive the link for the webinar! Given that presentations have become indispensable in our everyday lives, whether at school, in college or at work, the SlideWiki platform, which is the main focus of the SlideWiki project, provides an open-source online platform for collaboratively creating and sharing Open Educational Resources (OER) in the form of presentation slides. 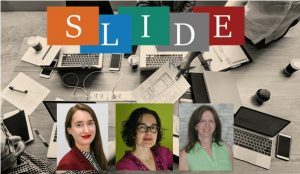 Unlike other OER repositories, the SlideWiki platform is designed to ensure the reuse, mixing, and repurpose of OER material and slides, and to help educators gain access to new course materials. SlideWiki combines an online slide creation and presentation tool with a number of interactive features such as comments, ratings, and self-test questions. All content published on SlideWiki is made available under the CC-BY-SA 4.0 Open Creative Commons license, which means that the content can be shared, modified, translated and reused enabling thus efficient collaboration. In addition, the open-source SlideWiki platform minimizes the effort of creating, translating and developing structured teaching and learning material through crowdsourcing. Similar to Wikipedia for encyclopedic content, SlideWiki enables the collaborative creation of comprehensive OpenCourseWare (OCW) with the objective to semiautomatically translate this content into more than 50 different languages, improving the quality of translations, and supporting the engagement and social networking of educators and learners.